The firm conviction that no animal is ever going to hurt me would, if I lived in some parts of the world, be a fatal error. I don't believe for instance the stories about hippos being deadly killers. They live on leaves, bark and vegetation, for heaven's sake, which is pretty much what I eat every day. Vegetarians aren't dangerous. I like spiders and snakes, having had a tarantula walk on my hands and an African rock python wrapped around my neck. The snake smelled my forearm with a darting tongue before nuzzling the back of my hand with its head, as a cat would, while the spider touched my palm softly with her foot, feeling for danger and finding none, before planting her surprisingly heavy body and raising another tentative leg for the next step. In both cases I got a strong feeling of shared sentience. All this, I'm guessing, has its origins in a childhood spent in Scotland, a country devoid of dangerous animals, except for the female Homo sapiens, which will attack when provoked and has been known to bite the head off the male after mating. So when the biggest pig I've ever seen comes lumbering out of the New Forest at me, I stand my ground, certain I won't get hurt, despite the huge disparity in our weights and probably intelligence. Sure enough the quarter-tonne sow stops short of trampling me into the dust and contents herself with nuzzling my groin with a wet and substantial snout. The civilities satisfied, she hangs out with me for a while on the grass verge before, like an oil tanker at sea, turning majestically into the wind and setting off into the woods again, on a mission that Rachel explains to me, as we stroll back to the car. "It's called pannage," she says. "What is?" I say, furtively wiping my trousers and hoping sow slobber doesn't leave stains. "What you've just seen," she says. 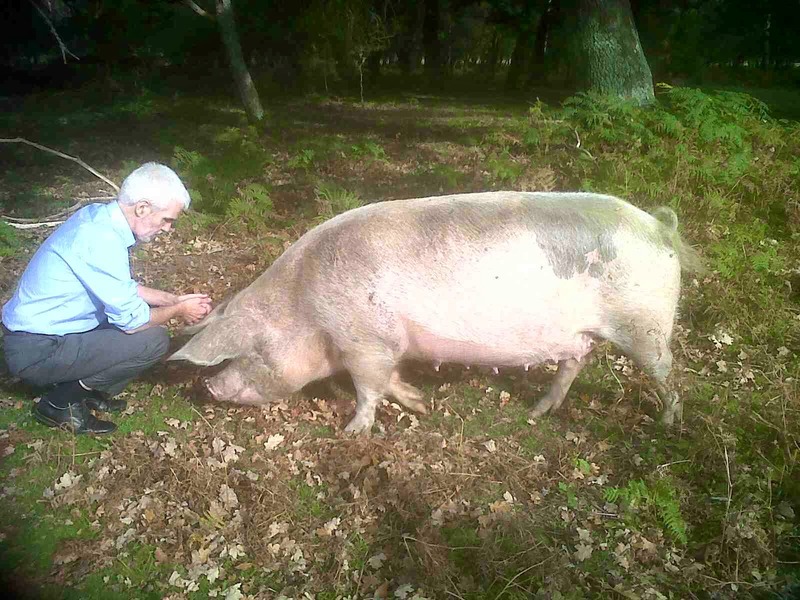 "The owners release their pigs in the autumn to wander around the forest, eating the acorns that could otherwise poison horses and cattle. It's a practice that goes back centuries. It's even mentioned in the Domesday Book." "Fascinating," I say. "My Mum thought pigs were great. Her grandparents had smallholdings in Shropshire, and she'd often spend holidays there as a child. They kept pigs, hens and ducks, she told us, and she loved them all. The pigs, she said, were especially affectionate." "They are sociable animals," Rachel says. "And at least as smart as a three-year-old child. They're very clean too, contrary to their image. Newborn piglets leave the nest to go to the toilet within a few hours of being born." "Impressive," I tell her. "It took me years." "What's more, pigs don't eat like pigs," she says. "They take it slow and savour their food. I'm with your Mum. Pigs are gorgeous. According to one biologist, no other animal is as curious and willing to explore new experiences. "Pigs are incurable optimists," he says, "and get a big kick out of just being." "Are they ever dangerous?" I ask. "Only if you threaten their young," she says. "Or look like competition to a dominant male for the affections of a female." "What?" I say in sudden alarm, ending the fruitless trouser-wiping and looking up to see another pig, even bigger than the first, emerge from the trees, sniff the air and fix an undeniably irate eye on the two of us. "Tell me something," I say, lengthening my stride and trying to estimate our chances of reaching the car before this big boar gets to us. "How attractive, on a scale of one to ten, would you say that sow just found me?"